NSF International will use unannounced audits and check actual repair work under a new body shop certification program announced in July, the organization said recently. “Equipment and training are great inputs and necessary ingredients for a successful repair but that alone isn’t enough,” NSF automotive certification business unit manager Alton Lee wrote in an extensive August email interview with Repairer Driven News. The program will cost between $5,000-$7,000, depending on which of four certifications is desired — cosmetic, structural, aluminum cosmetic and aluminum structural — and how many shops are being certified within a group. That dollar amount also includes the travel expense for the on-site audits by AccuracyDriven4. “We understand this is a large range but this is due to the complexity and variability of repair shop configuration,” Lee wrote. The collision repair certification landscape already includes Assured Performance and VeriFacts — both of which have deals in place with OEMs — and luxury OEM in-house programs. Nevertheless, NSF could distinguish itself as a complement and as a rival, according to Lee. NSF won’t consult or train, and unlike some other certifications, it “audits actual work being performed on site,” he also wrote. However, the program doesn’t yet have any OEMs adopting its program, unlike Assured Performance (which perhaps most notably certifies Ford’s aluminum Ford F-150 repairers) and VeriFacts (which recently received the nod to certify Cadillac CT6 shops). Shops must pass at least three onsite audits to be certified, Lee said, and they’ll face unannounced quarterly audits afterwards. AccuracyDriven4 will be looking at both the equipment and training “inputs” as well as the work itself, according to Lee. NSF will require employees to have “training traceable to an industry recognized training provider” for their current roles. OEMs at NACE expressed a desire to make life easier for certified shops by requiring specifications — not brands — for certified shops’ gear. However, there are cases where manufacturers demand specific brands for repairs, and while inconvenient (a glut of rivet guns is one note we’ve heard), collision repair best practices dictate following the OEM party line. So it’s a little worrisome that NSF would break from that tradition, even if it does demand proof from the tool manufacturer. In this vein, it seems as though NSF will face a hurdle to adoption in its embracing of non-OEM parts through another certification program. OEMs are more aggressively pushing new or official Opt-OE parts, which makes it seem unlikely they’d back NSF certification for their networks despite the tough repair auditing Lee describes. And some of the most qualified shops in the industry are major proponents of OEM parts. However, Lee wrote that NSF didn’t see a conflict of interest with its certification program and parts policies. “NSF International’s repair shop certification program does not require shops to give any kind of preferential treatment to NSF certified parts over OEM parts,” he wrote. “We understand that today many shops are supporters of OEM-only parts, mostly because they have had issues in the past with low quality aftermarket parts. 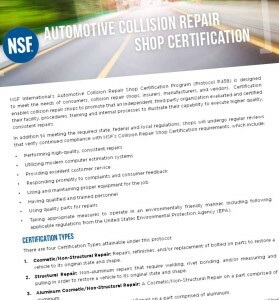 NSF is also hosting a webinar today on the collision repair certification at 1 p.m. ET. The link appears broken on the NSF website itself, but it appears to still work here on BodyShop Business. Even if you’re unable to register, Repairer Driven News will be listening in and covering any new developments, so continue to check here for further updates.